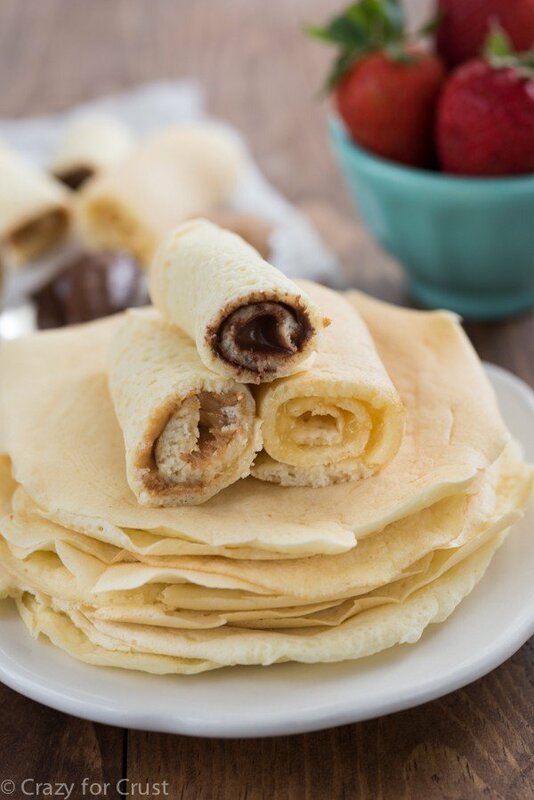 Easy Pancake Rolls, 3 Ways – Sometimes you just want comfort food for breakfast. 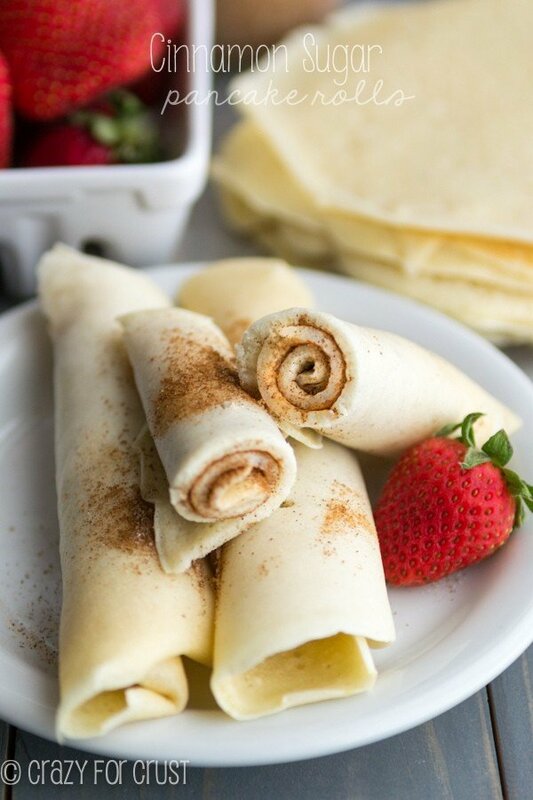 These Easy Pancake Rolls are comfort food at it’s finest, and you can fill them with your favorite flavors. Are you a Nutella? Or a Peanut Butter? Or a Lemon? Or something else entirely? I’m all three. Last week was Spring Break for us. We spent it visiting family in San Diego. The week before that, the last week of school, was state testing week. Do you have common core where you are? Common core is new here in California this year. Writing my feelings about this curriculum and how it’s being taught and handled is a post in itself (and it would probably include lots of swear words). Next year I’ll be opting Jordan out of testing, but I didn’t realize you could do that in time for this year’s tests. What’s a kid need on state testing days? Pancakes of course. (With a side of protein and fruit, obvi.) Pancakes are Jordan’s comfort food. These pancake rolls are the ones she asks for most often. She eats them for breakfast, we eat them for brinner, and she often has them for an after school snack. Now I’m making my favorite easy pancake rolls with a new twist: fillings. 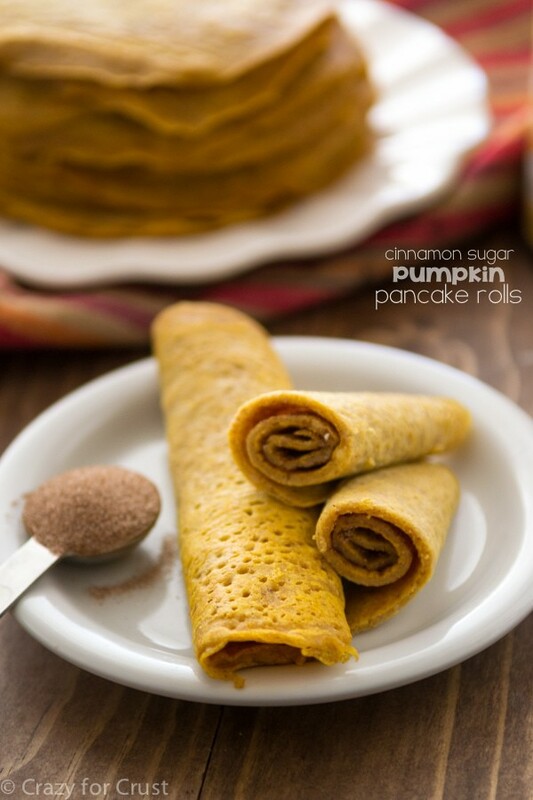 The filling isn’t limited to cinnamon sugar. You can fill them with whatever you want. I made you three versions today. Want to see? Peanut butter and honey. Or, if you want, peanut butter and jelly. Great for breakfast, snack, or even lunch. And three, everyones favorite, Nutella. Or chocolate peanut butter. Or Hershey’s Almond Spread. Or…. These pancake rolls are not unlike crepes in their shape and size. But they are unlike crepes in that they are pancakes. You just make the batter really thin by adding more milk. Thinner batter = thinner pancakes. Thinner pancakes are ripe for rolling. I start my batter with Bisquick. I always have. 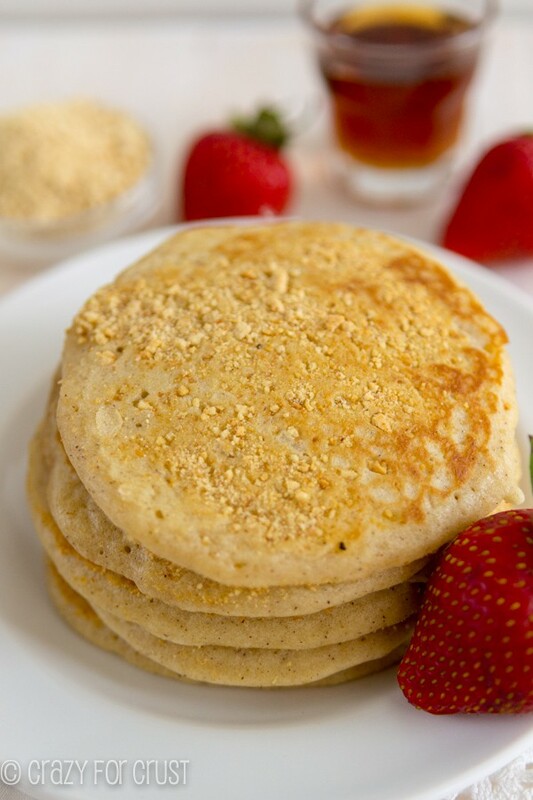 Bisquick is my go-to pancake mix when I don’t want them from scratch. I used the heart healthy white box of Bisquick for these but I’ve used the yellow box too. Use whichever you prefer, or use your favorite mix or scratch recipe. Just add about 1 1/2 times as much milk. You want a thin, drippy batter. The original recipe post has a video on how I make my pancakes. I use a small skillet and make them one at a time. It takes some time, yes, but I always make a big batch and then freeze the leftovers. That way I can make comfort food breakfast for Jordan whenever she wants it. 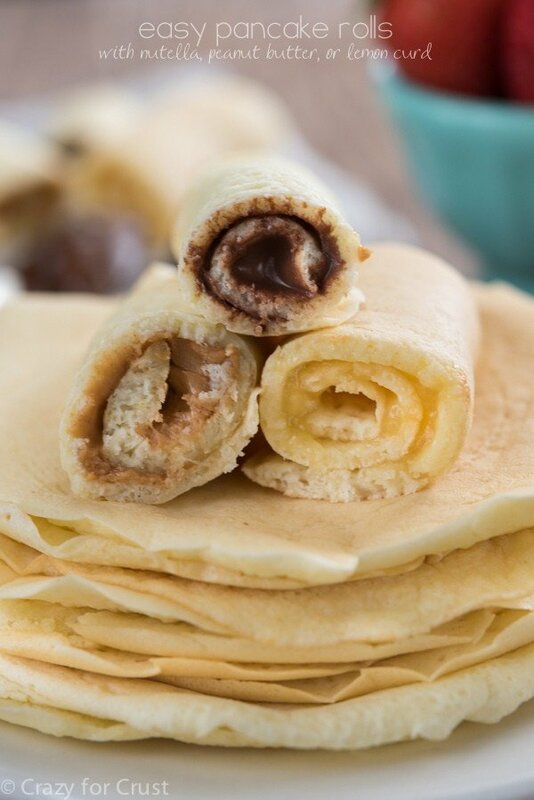 Make a batch of these easy pancake rolls and make everyone happy at breakfast by filling them with Nutella, peanut butter, or lemon curd! Whisk Bisquick, egg, vanilla, and milk until thin. The batter will be very thin and will drip easily off a spoon. Heat a small 7-8" frying pan over medium-low heat. Spray with cooking spray (or grease with butter) and add about 1/8 cup of batter in the pan. Swirl the pan to spread the batter into a large thin circle (like you're making a crepe). Cook until the top is filled with bubbles and you can easily flip the pancake. Cook for just a few seconds more then place on a plate. Repeat until all batter is gone. 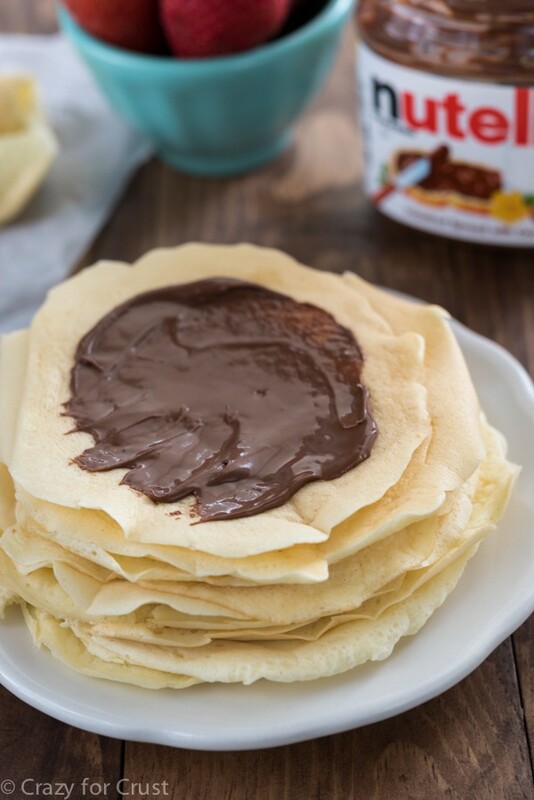 Top each pancake with desired filling and roll up. Serve warm. 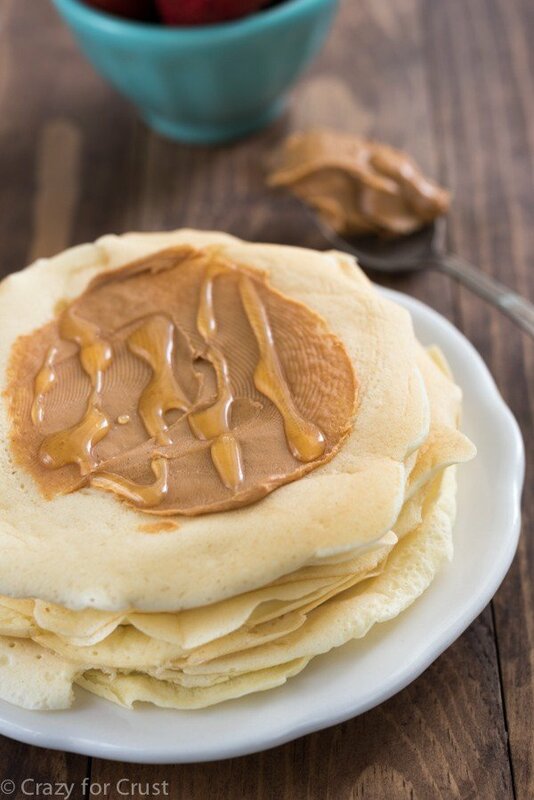 Pancakes are good for up to 3 days if stored in the refrigerator. 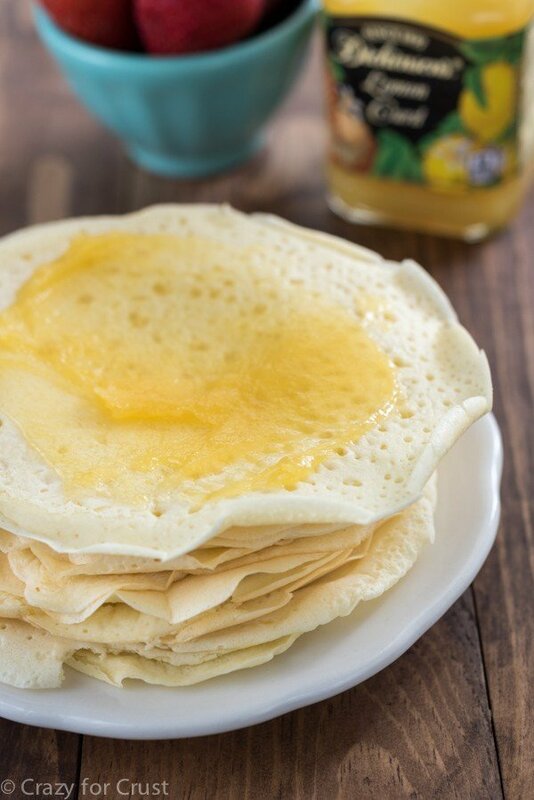 Or, layer each pancake between paper towels or wax paper and freeze in a ziploc bag for up to 1 month. To reheat, removed desired amount of pancakes from freezer and microwave each for 15-30 seconds. I think you totally deserve Pancakes rolls for state testing days too. Bravo on getting through that! Yes! Jam and cream would be perfect. If you can’t find the bisquick, you can use any pancake mix. Just make the pancakes thinner (add more milk to the batter so you get a thin pancake). My daughter loves to roll hers with sugar, but next time I’m totally pulling out the lemon curd. YUM!!! These are the perfect breakfast to keep on hand in the freezer.